I had planned to focus on indigo last summer, but in the event various other things intervened – although I did accomplish more than I posted. I must show you my shoes! I’m making tentative plans for more blue this summer. I had hoped that the tadeai, the Japanese Indigo Polygonum tinctorium, would survive the mild winter in its house but even though I added fleece and bubblewrap when the nights dropped to -4C, there’s no life in the stems. It may be an obligate annual, or it may simply have flowered itself to death late last autumn without setting any seed, alas. I admired the few remaining dead leaves somewhat wistfully: look, they’re blue! And then cut most of the stems off. I’ve left a few root masses with stubs of stem for the moment, but there was no green in the pith and the roots I pulled up looked brown and dead, so I doubt anything will shoot. But I sowed seed as well; the seed tray is now sitting indoors in the warmth where I am already watching it hopefully. I took cuttings – lengths of stems with leaves – from the plants last October when we returned from our holiday and put them in a jar of water. As might be expected from a Polygonum the cuttings formed masses of roots from the submerged leaf nodes, but the rest of the nodes sent out flower shoots. I pinched them out and more appeared. The cuttings were extremely well-rooted and looked reasonably healthy in late January when I potted them, but just continued to try to flower until they died, leaves slowly shrivelling. A friend who rooted cuttings in August says two are still alive and seem well, so I wonder whether the trick is to catch them before environmental cues set the growth points to ‘flower’ mode. I will try to test that this summer, as cuttings would be the best way to maintain a line that dyes well. The woad looked reasonably happy. As a biennial this is its year to flower and seed, with leaves that yield little or no blue. I left the plants last year thinking to gather the seed – these were grown from seed I harvested two years ago – but there isn’t really enough space in our tiny garden to keep plants for seed especially when they attract so many Cabbage White butterflies to lay eggs on my salad rocket! The woad is no longer happy: it is composting and I’ll sow more in the Brassica Bed shortly. All this plus ‘standard’ indigo vats means there should be more blue this summer. But what shall I do with it? I’m designing stencils to print with fresh indigo leaves, because that was immense fun. But there’s much more fun to be had: a friend sent me two fascinating books. This is the work of Mrs Akiyama, who made a personal study of the natural dye plants of Awa in Tokushima Prefecture, Japan. Awa is famed for its Polygonum tinctorium indigo dyes; there are pages detailing dyeing with fresh and dried indigo (if I’d had more dead leaves I could have dyed with them!) as well as many other plants. And there are notes on working with bast fibres, as well as information on finishing yarns and fabrics after dyeing. No more peering at fuzzy videos on YouTube! With luck this will be a summer to remember. To finish, a reminder of last summer. Super-cheap runners, sold as ‘cotton’ (I have my doubts, see below). I washed them thoroughly with dishwashing liquid and rinsed them thoroughly too, then dumped them into a standard thiox indigo vat on the stove.^1 No matter how many times I dipped them, the uppers would not go darker than this; given the depth of blue in the soles. I wonder whether the fabric is in fact polycotton. The first dyeing attempt was extremely patchy when it dried. Blotches of pale fabric near the heels, more blotches on the toes. I left them outside in the weather for a week or two to think about their sins while I sulked. Then I needed to exhaust the vat, so I reheated it, added reducing agent, and chucked them back (dry, I think), out of curiosity rather than any expectation of success. Imagine my surprise when, after two or three dips, they emerged a relatively solid and respectable pale blue. After washing thoroughly and drying, I considered decoration: stencilling with fresh tadeai was the obvious answer. I cut an assortment of crude paisley stencils and discovered that stencilling on curved surfaces is rather tricky. But the end result is a pleasing variety of blues produced by a variety of indigo techniques, especially when embellished with tablet-woven laces. ^1: A caution. If you try this, be prepared to spend ages scouring melted runner-sole off the sides of the pot. A hint: reheating the pot gently softens the stuff a bit, but it still requires a lot of effort. This entry was posted in Indigo, things for feet, Uncategorized, Woad and tagged dyeing, indigo, SummerOfBlue on April 7, 2016 by sarahw. How the magic works: the chemistry of blue. The transformation from green-yellow to indigo blue that takes place before your eyes when something is removed from an indigo vat is the nearest thing to real magic that I know of. But it’s not magic, it’s chemistry, and understanding it is helpful in troubleshooting vats and in choosing vats for specific fibre types. Where does indigo come from, and why is it there in the first place? Most of the indigo used commercially is now synthetic indigo, one of the myriad colours chemists derived from the magic compound aniline in the 19th century. I’m more interested in natural indigo, which is extracted from plants such as Woad (Isatis tinctoria, a member of the Cruciferae, related to cabbages) and Japanese Indigo (Polygonum or Persicaria tinctoria, a type of knotweed) in addition to ‘true’ Indigo, Indigofera, a member of the Leguminosae (related to beans and peas) which has several species including tinctoria and suffruticosa. In fact many plants will yield indigo, but only a few yield it in sufficient quantity to be of any use in dyeing. I haven’t yet found a reference giving a firm reason for the presence of the indigo compounds in plants, but a couple of papers suggest in passing that it might discourage pests. Indican, the compound that yields indigo blue, is a glycoside: a sugar (in this case a form of glucose) bound to another molecule, indoxyl. When the glycosidic bond is broken, the indoxyl is freed. When the indoxyl compound is oxidised, it becomes blue: indigo blue. Sounds simple enough, but how does the processing of the plant material and the dyeing accomplish this? The indigo-bearing leaves (it’s usually the leaves; the lower the amount of other plant matter, the better the final grade of indigo) are harvested. In Japan the Japanese Indigo leaves are dried in the sun and stored for later use. Elsewhere the leaves are then physically damaged – chopped, pounded or trampled – presumably to release larger quantities of indican. This is the point at which woad was traditionally made into balls of leaf matter and dried for easier storage and transport. In West Africa the pounded leaves might also be dried and stored at this stage. Alternatively (in West Africa and elsewhere) the mass of fresh leaf material might be fermented; in Japan the dried leaves are later moistened and fermented; in Europe the woad balls are moistened and fermented (the process known as couching). In other words, bacteria are encouraged to consume the glucose in the indican, leaving the indoxyl molecules as highly reactive free radicals. The bacterial breakdown of glucose may be an aerobic process in which the bacteria consume oxygen, creating the reducing (low oxygen) environment necessary for the next stage of the process, or an anaerobic process in which the bacteria release hydrogen that acts as a reducing agent in the next stage. The indoxyl free radicals bind to each other to form indigo. If an alkali is present (pH is above neutral), this takes the form of water-soluble leuco-indigo (leuco means white), also known as white indigo or white indigotin. The ‘white’ refers to the compound’s relative lack of colour: the leuco-indigo solution is a clear yellow or yellow-green. This is the form in which indigo dyes, so at this point it is possible to convert the fermentation vat to a dye vat, or to continue the process to extract indigo from the solution. Extraction is simply a matter of converting the soluble leuco-indigo to its insoluble blue form by adding oxygen: straining the fluid off the leaves, then pouring it back and forth between two containers may be sufficient, after which the blue particles of indigo can then be filtered out of the liquid. 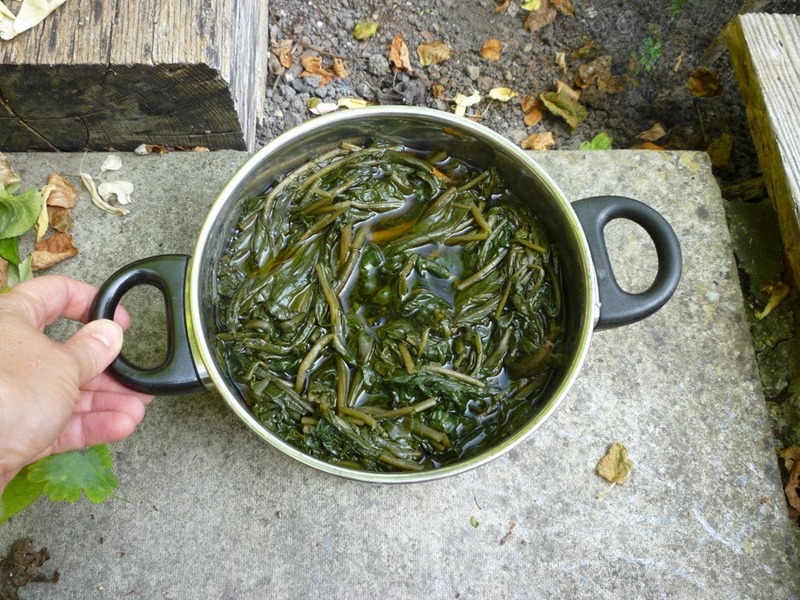 I wrote a post (with lots of pictures) about processing woad leaves in this way in 2013; you can see it here. The actual indigo pigment content of the particles is reported to vary from 12% for Japanese Indigo, through a maximum of 40% for woad and 77% for Indigofera indigo. The remained of the mass is plant matter, mineral matter and other pigments such as indirubin (known as indigo red and one of the components of Murex purple). This mix is one reason that natural indigo produces more variable shades of blue than the purer synthetic form. Handspun Bombyx silk indigo-dyed in three different vats. The dark blue on the left was put dry (unwetted) into a 1-2-3 Fructose vat, to which I added a little more fructose and heat to raise the temperature back to 50°C before leaving the silk for 45 mins. The patchy warm-grey-blue on the right was well-wetted before spending an hour in the urine vat. The curl of bright blue silk in the centre had 5 dips in a standard Thiox vat. Whether they’re based on synthetic or natural indigo (including plant material that contains indigo), all indigo vats work on the same basic principle: convert the blue indigo into soluble leuco-indigo, then allow that solution to penetrate the material to be dyed. As leuco-indigo only maintains that form in the absence of oxygen, the vat must be reduced – the oxygen removed – in some way. Traditional vats use bacterial fermentation: the vats contain organic matter on which bacteria feed, such as the nutrients in urine, rice bran, the plant material that contains the indigo compounds, or even the skin flakes, sweat and manure held in a sheep fleece. Chemical vats use raw chemistry, compounds including sodium hydrosulphite or thiourea dioxide or reducing sugarssuch as fructose to remove oxygen from the vat. pH – the acidity or alkalinity of the vat – is important, as the conversion to leuco-indigo requires an alkaline environment. It’s easiest to predict and maintain in a chemical vat, with recipes calling for measured amounts of lye (sodium hydroxide) or washing soda/soda as/soda crystals (sodium carbonate) or calc aka calcium hydroxide aka slaked lime. It’s just as important in a biological vat, but much trickier to maintain, because the fermentation process produces byproducts such as lactic acid that lower the pH. Apparently dyers in the past learned to manage their vats by tasting the fluid or feeling it between their fingers, trying for something that’s slippery (alkaline), but not too slippery. Fortunately we have pH paper, which works even for indigo vats – the blue does not appear so quickly that it prevents reading the pH. pH also influences the dyeing process in other ways. Both cotton and indigo are ionised at higher pH; there are two forms of leuco-indigo, and the most ‘efficient’ of these in terms of dyeing is most common at pH11, which is also the pH at which de-protonation/ionisation of the cotton (and possibly other cellulosic fibres) has begun, making it attract the dye. So cellulosic fibres are best dyed at pH11. But protein fibres such as silk and wool are damaged by high pH, and heat accelerates the damage. pH paper allowed me to confirm that my sig (urine) fermentation vat does indeed run at about pH 9 in the relative coolth of the pop-up greenhouse, whereas the 1-2-3 Fructose vat I created yesterday was pH11 at 50°C. So: to dye my handspun silk (a smooth, dense fibre, hence takes up less dye) a dark blue, I had the option of multiple dips in the urine vat OR a shorter single dip in the Fructose vat. Having said all this, pH paper and knowing how to use it doesn’t guarantee success with a biological vat. I think the current woad vat may be a loss, possibly because I used garden lime instead of calcium hydroxide to try to control the pH. But perhaps there’s so little blue present that I’m not seeing it on the material. Further work required. There are far too few pictures in this post, so here’s a Norwich damask, a dress fabric dating from the early 1700s. Handspun 2-ply wool warp; the purplish shadows in the pale areas hint that the warp was once dyed reddish-purple, probably with logwood, long since faded except where protected inside the seams. The handspun singles weft is clear pale indigo blue. The original fabric was probably lavender-lilac purple with red-purple patterning. Hall, K, 2012. Indigo background (written specifically for South Carolina teachers). This entry was posted in historic textiles, Indigo, Woad and tagged dyeing, indigo, SummerOfBlue on May 26, 2015 by sarahw. Woad Fermentation Vat No. One: Day Seven. In fact a summary of days 2–7. In pictures and words. I really, REALLY wish I could share the smell as well, as I think that’s significant, but I daresay many of you wouldn’t enjoy the, er, pungency. It’s living in my office/spare bedroom, and I’m just hoping the smell won’t linger once the vat is finished. I had intended to keep it in the garage, but it wouldn’t be fair to inflict it on my husband. According to the thermometer on the vat the brewing belt is running slightly hot, I think, nearer 28 than 23°C, so I’ve wedged a pencil between the belt and the vat to reduce the heat input. The organic matter is waterlogged and has sunk to the bottom. There are a few bubbles, some patches of scum, the vat smells of rotting vegetation. The pH is low (acid): I sprinkled 1/2tsp of garden lime on the surface and stirred it briefly and gently. Over the next three days the vat liquid became darker, the smell of rotting vegetation intensified, the greyish scum became thicker. 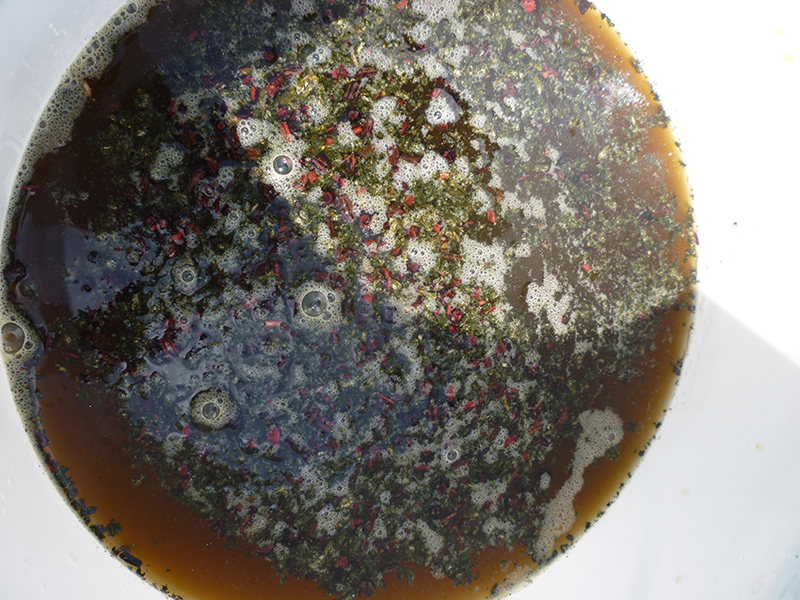 Daily pH tests gave readings of 7–9, lowered by the acids produced by the rotting woad and bran; I sprinkled another 1/2 tsp of lime on the vat on Days 3–7. 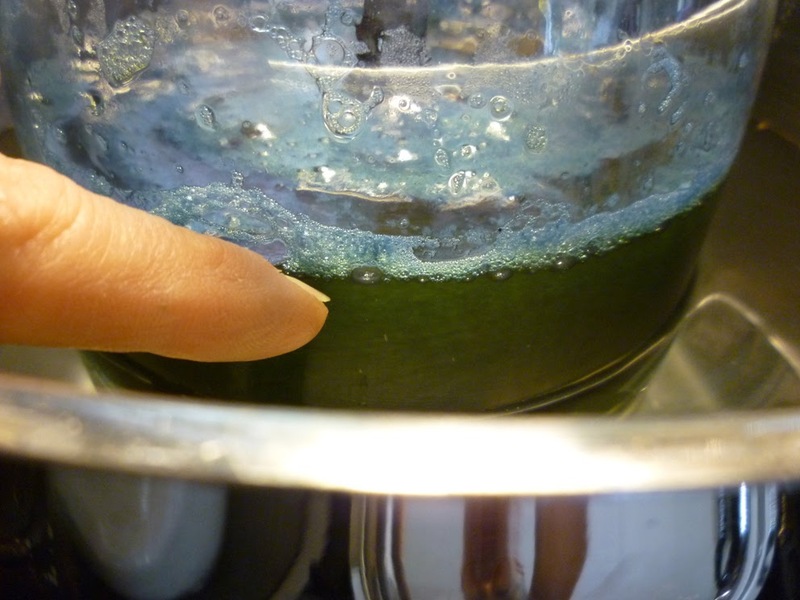 When in doubt, go alkaline as indigo will not convert to the soluble form in an acid environment. The smell became more complex. I can’t think of a good way to describe it, but no longer ordinary rotting vegetation. Richer, darker. Day Seven. I suspect fermentation has peaked, as after yesterday’s lime the pH remains high – it’s well over 9, the maximum on my packet scale. The vat liquid is dark, there are now scattered patches of a thin shiny, almost metallic scum on the surface. The smell is richer, more complex, and not particularly pleasant (I much prefer the odour of a fermenting urine vat!). The combination of changed odour and high pH made me think it might be worth testing for blue: the strings are tied to some scraps of scoured muslin that I’ll leave in overnight, and for multiples of 12 hours. I have a strong suspicion that 100g of woad leaves won’t produce a strong blue in any case. 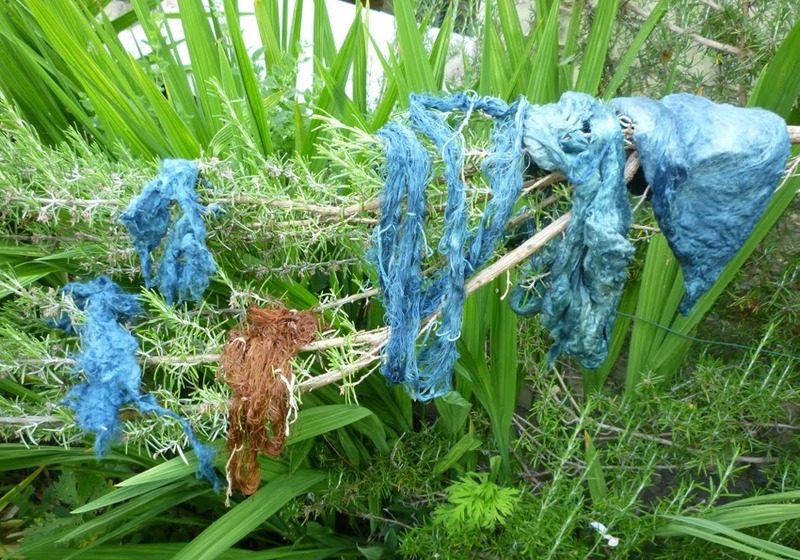 This entry was posted in Woad and tagged dyeing, SummerOfBlue on May 16, 2015 by sarahw. Woad Fermentation Vat No. One, Day One. So it begins. 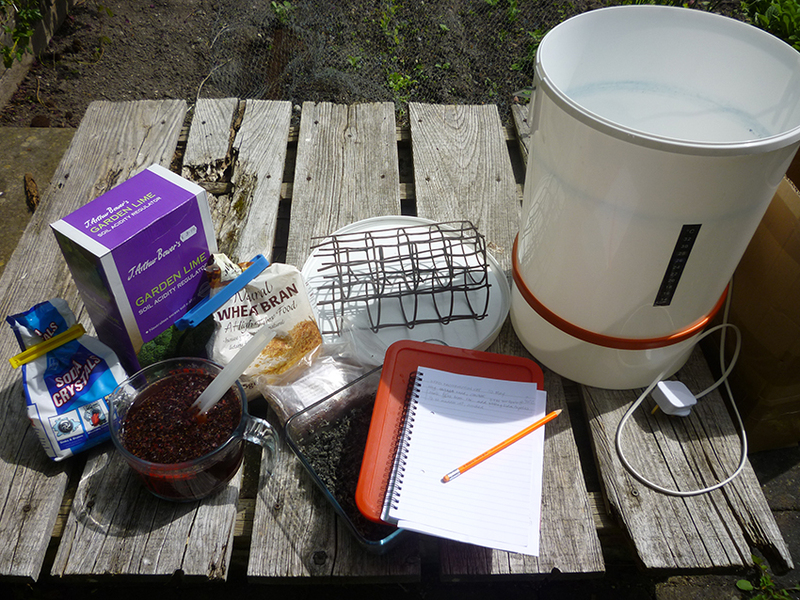 Over the last couple of days I’ve been assembling and collating information about indigo, woad, and fermentation vats. I’ll post a summary in due course; today I started my first woad vat using my first ‘best guess’ for a process based on my reading. 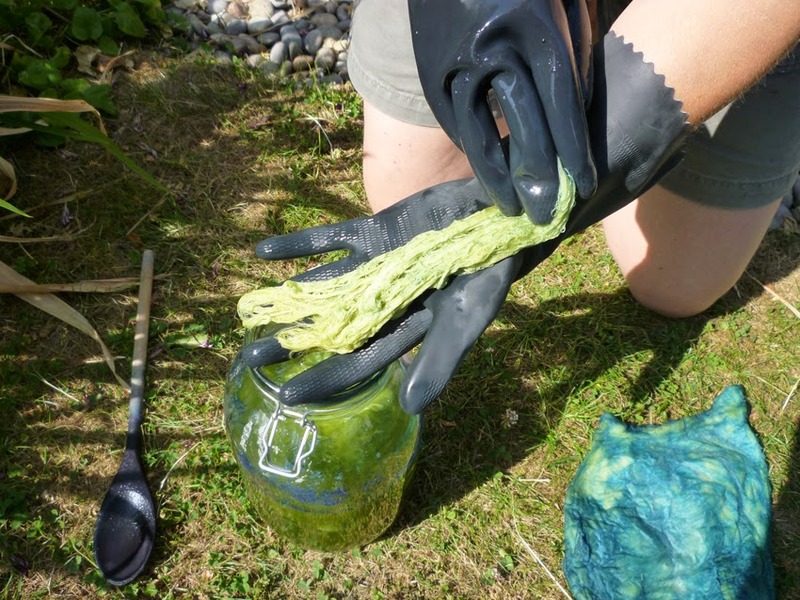 It’s largely based on the instructions for a woad vat in Liles’ The Art and Craft of Natural Dyeing, but without the addition of indigo powder: I want to see what blue I get from 100g of woad ball before I add indigo. 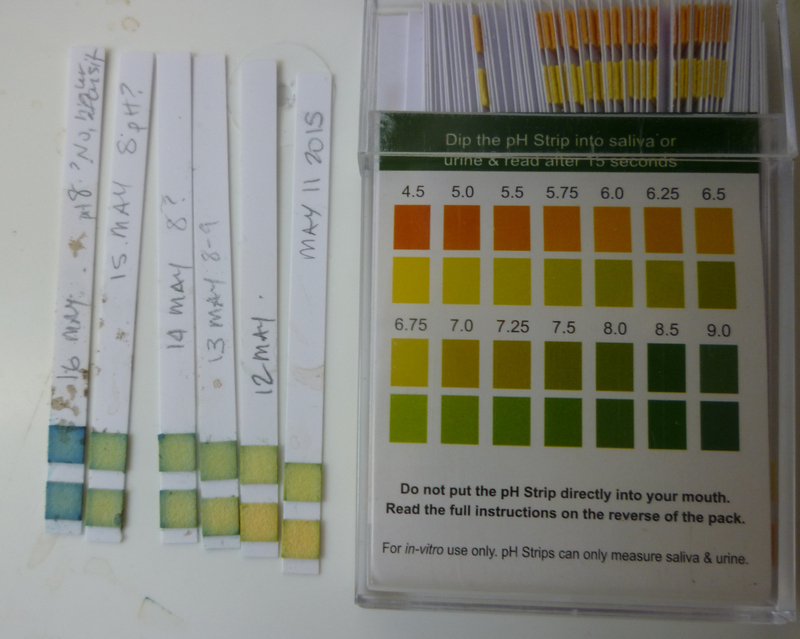 I aimed for the pH levels described by Dorothy Miller in Indigo, from seed to dye. In Indigo Jenny Balfour-Jones describes the couching of woad balls. According to her sources, when the process is complete good woad is dry and mouldy, a condition known as “well beavered”. Mine wasn’t completely dry (I’d left it covered), but it was covered by a remarkable fine grey-white mould. 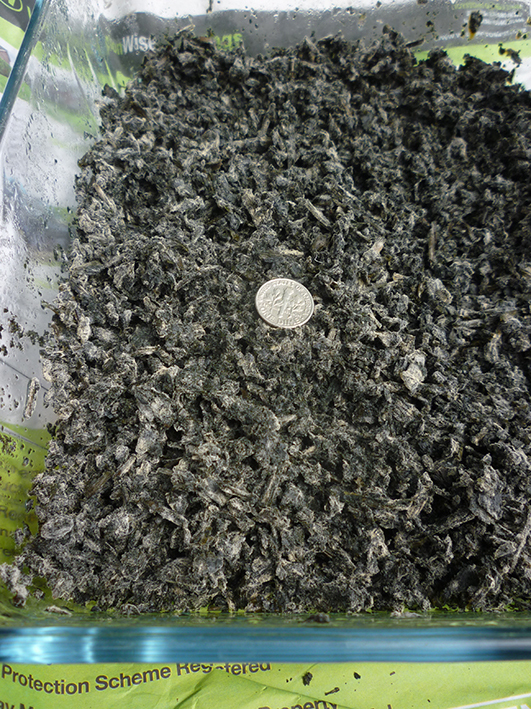 The entire couching process seems to have taken place very quickly, perhaps because I used rainwater rather than tap water to avoid chlorine and other inhibitors of bacterial growth: on 7 May I crushed 100g of woad ball, moistened it with rainwater, and set it next to my desk so I could see what happened. I kept a lid on the dish to retain moisture. It heated up within hours; I turned it on the 8th and again on the 9th, by which time it was cool. I assembled my kit. The white bin holds 25l/6 gallons; the black strip on it is a liquid crystal thermometer, and the orange thing is a ‘brewer’s belt’ that should maintain a good fermentation temperature, somewhere between 22-28°C. I plan to put that coil of plastic mesh or something similar at the bottom of the vat to keep cloth and fibre away from the fermentation debris. Liles gives quantities for 6-8 gallons; I halved them for a 3 gallon/12.5 litre vat to begin with, and used washing soda rather than lye as an alkali. 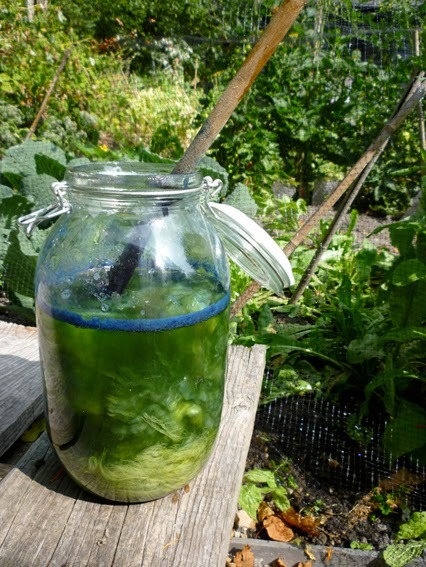 I dissolved 0.5oz washing soda in 1 litre hot boiled tapwater (boiling should drive off the chlorine), added 0.5oz wheat bran (slow release carbohydrates to fuel fermentation) and 0.5oz madder root (traditionally added because the bacteria on the roots kickstart the fermentation process). 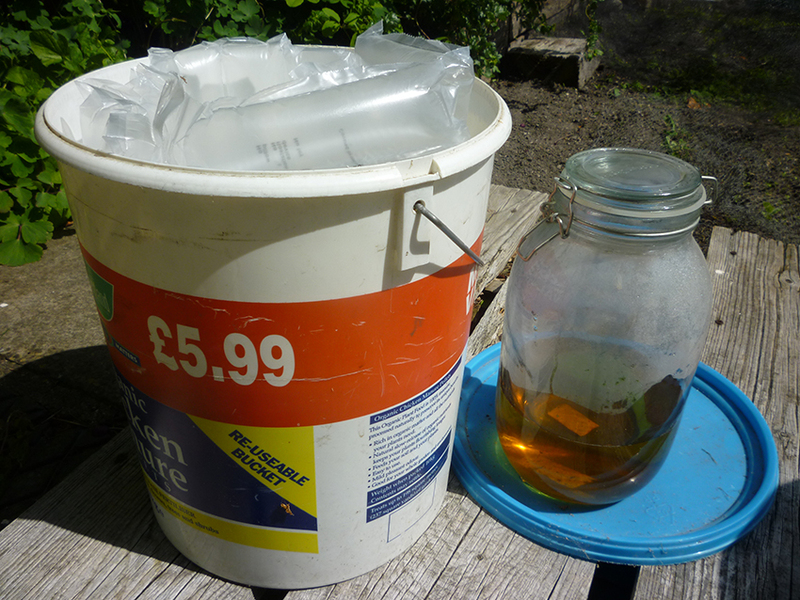 I left this to soak for an hour to hydrate the bran before pouring it into the bin and adding 8 litres of rainwater (total 9 litres). 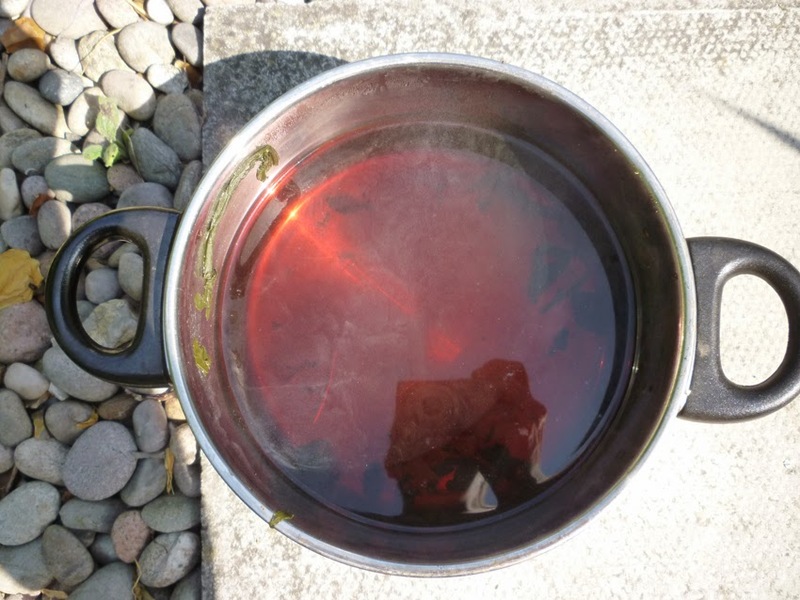 I boiled 2 litres of tapwater, added 1.5 litres of rainwater, and brought the entire volume to 70°C on the stove: woad contains both indican, the precursor for indigo blue, and isatan B, a related compound that will create blue, but which according to Balfour-Paul requires a higher temperature at the start of the fermentation process followed by rapid cooling. I scraped the couched woad into the hot water, stirred it thoroughly for 5 minutes, then dumped it into the vat solution to cool it rapidly. Maintaining the correct pH range is critical for a healthy fermentation vat, and the dyeing process. If fermentation is too enthusiastic, lactic and other acids will drop the pH to the point that the vat will not dye. The acidity must be countered by an alkali, but if the pH is too high fermentation will cease and the vat will damage protein fibres. 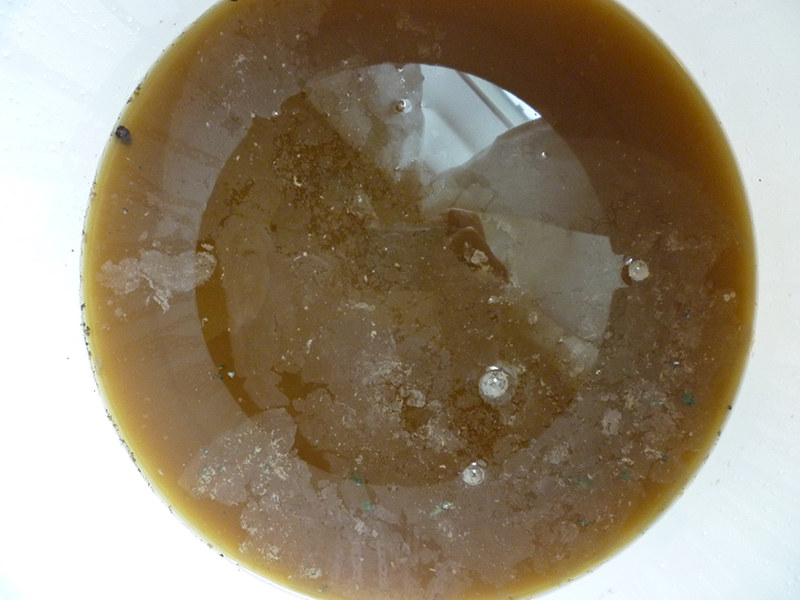 A pH of c. 10 appears to be good for both fermentation and dyeing, although the woad vat should operate down to pH 8. I decided to aim for pH10 in the vat before fermentation starts. According to my pH meter I was bang on. Remarkable! I therefore omitted the 1/2 tsp lime called for by Liles’ recipe; it may be that our rather alkaline tapwater (pH 8.4) rendered it unnecessary. 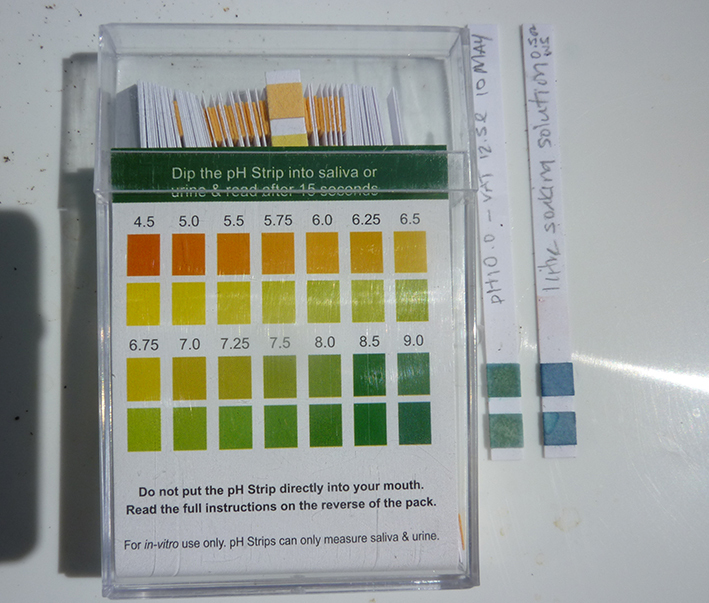 I bought pH paper – litmus paper – to check the pH of my fermentation vats a couple of years ago, but neglected to check that the range was appropriate. Mine are intended to check the pH of body fluids (don’t ask, I don’t know and I don’t want to know) and the chart only goes to pH 9 whereas for these vats you’ll need them to go all the way to 11. However it seems that the paper will indicate the higher readings, I just have to create my own calibration records based on the pH meter. Note that the pH 10 paper is in fact more blue-green than it appears. The very blue paper on the right was the 1 litre initial stock solution, which had a pH of 11.2. 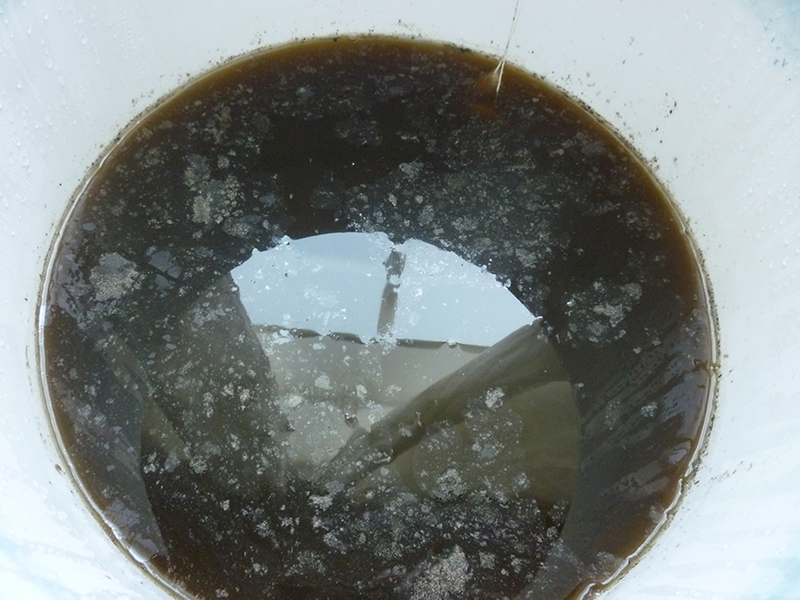 One thing is very clear from my reading: a good working fermentation vat is as much a matter of luck as judgement. Japanese indigo artisans pray to Aizen Shin, the god of Ai (indigo) for success. I shall drink a toast to Ai tonight, just in case. I’ve started preparing for the next vat, too. Guess what that will be based on? 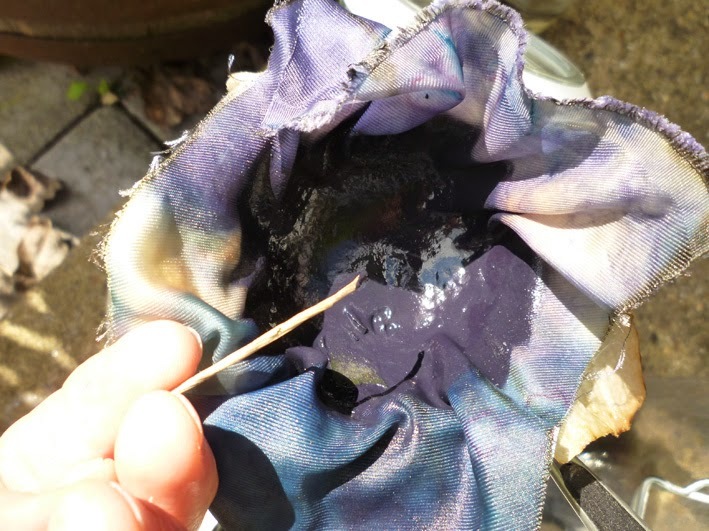 This entry was posted in Indigo, Woad and tagged dyeing, SummerOfBlue on May 10, 2015 by sarahw. But I can tell you all about another chapter in My Adventures with Indigo. It’s a long one; you might want to make a cup of your favourite beverage now, before you start. About 12 months ago I ordered both Japanese Indigo and Woad seeds, my cunning plan being to throw cabbages to the wind and grow blue instead. Alas, I have no greenhouse: the bitterly cold winter and late, wet spring put paid to the Japanese Indigo, which even indoors scarcely showed a leaf before giving up the ghost. This isn’t the climate it was looking for. Woad, on the other hand, was and still is grown here as a crop, so I expected more of it. To its credit, it delivered. Woad is apparently a gross feeder, in this case meaning that it needs nutrients and lots of them, rather than having no table manners. I fed it regularly with blood, fish and bone, and watered regularly in dry weather. It’s biennial; the first year leaves give colour, the second year there is no colour (can’t vouch for this yet), but you get seeds to grow more. Harvest the leaves from midsummer on. This post depicts events on July 21, my first pick. I have both Jenny Dean’s Wild Colour (I have an earlier edition) and Rita Buchanan’s A Dyer’s Garden, both of which give instructions for dying with fresh woad leaves. It’s extremely straightforward. First grow your woad. 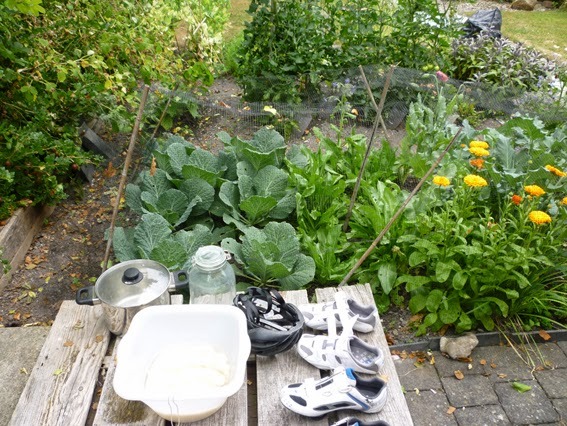 I suspect it’s important to move as quickly as possible from harvest to hot water, so I set up my kit next to the woad, which is the lowish, bright green, elongated leaves to the right of the cabbages. The net is essential: everything under the net is extremely dangerous is food for the caterpillars of Cabbage White butterflies. If you don’t prevent the adults from laying eggs on the leaves, you will have no leaves. Ignore our bike gear, it’s just drying out/absorbing UV to kill bacteria. Basic equipment for an afternoon of fun: well-wetted materials to be dyed blue, plus a large container (I used a jar because I can see the colour of the liquid in it), a large wooden spoon, rubber gloves, a glug or two of household ammonia, a BIG saucepan or stockpot (it will hold only water), with trivet and a thermometer accurate from 0–100°C. For further excitement you’ll need a saucepan you don’t use for food, and 1 tsp of alum mordant. Read the instructions below to make sure you understand what you’ll be doing and why. Fill the kettle (really full) and put it on for tea. Pick the leaves as quickly as possible, and stuff them into a container. A large glass jar is good because you can see the fluid change colour, which is helpful. No need to shred them finely or anything, I just grabbed handfuls, slugs and all, ripped them in half and stuffed them into that large jar. The kettle should be boiling by the time you finish: pour the boiling water into the jar, enough to cover the leaves. Make tea with the leftover, if you want any; I opted for squash instead. Leave the leaves to soak. If you plan to go straight to dyeing once you’ve got the indigo from the leaves, at this point you should half-fill a saucepan or stockpot large enough to hold your jar with water at least halfway up the sides, put the trivet in the bottom (to prevent the glass jar from overheating on the metal) and put it on low heat (you’re aiming for 100-120°F (38-48°C). If you haven’t got a trivet, I use a layer of metal table forks. The jar of leaves soaking in hot water. 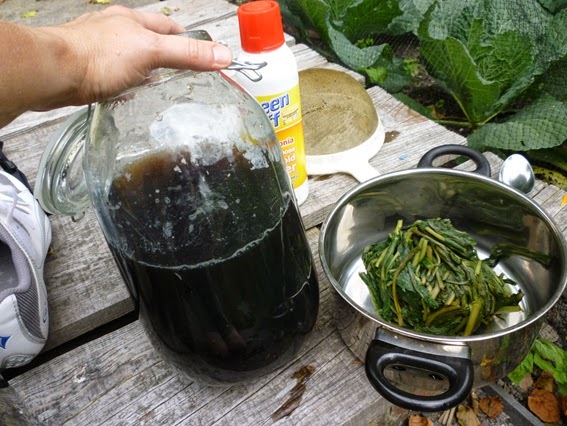 The fluid will change from water-clear to dark sherry-brown as the leaves wilt. After an hour, remove the leaves (I used a kitchen strainer), squeezing out every drop of fluid, and put them carefully to one side. You will use them again. 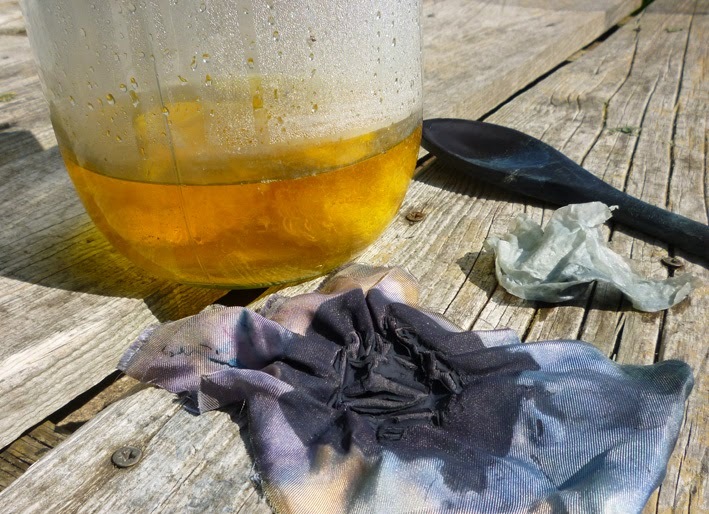 The chemistry of indigo dyeing is not complicated, but it’s important. 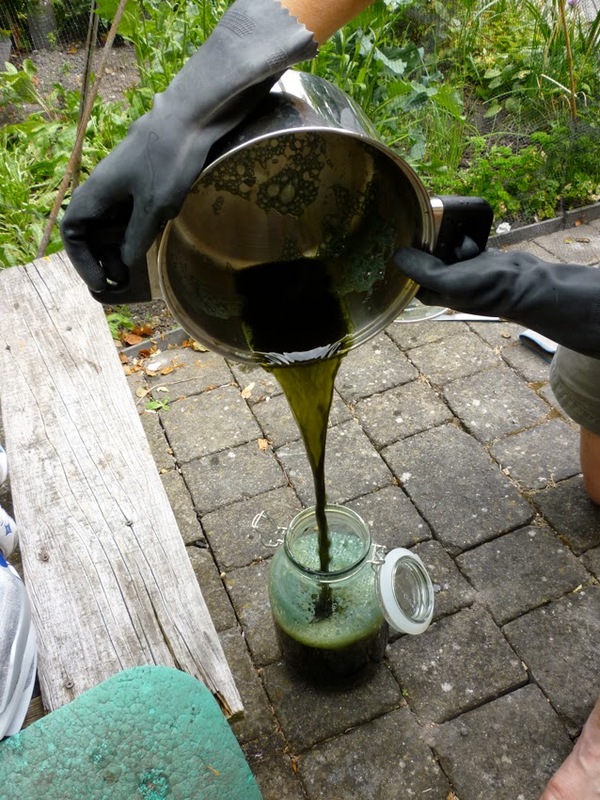 The dark brown fluid in the jar contains indigo from the woad leaves in the form of indoxyl (more detailed info on Wikepedia, scroll down to Extraction). To extract the indigo from the fluid, add a glug (about 1 tablespoon for this jar) of household ammonia to the fluid. Buchanan says baking soda will also work, I haven’t tried it.). Now pour the fluid back and forth between two containers, exposing it to the air as much as possible. You want bubbles and lots of them! The foam starts yellow but turns a beautiful turquoise as the fluid is oxygenated, transforming the indoxyl into insoluble blue indigo. Once it’s as blue as blue can be, it’s decision time. You can dye with the fluid and indigo, or you can filter out the indigo particles and save them for another day. Filtering takes longer to do but much less time to describe, so I’ll show you that first. If you want to DYE NOW! skip the next section. My reading suggested that coffee filters and such aren’t fine enough to trap the bulk of the indigo particles. Some people use proper filter paper, but I didn’t have any. Instead I used two layers of extremely finely-woven commercial silk fabric to line a small tea strainer. Straining a smaller volume (I did this with the second batch of woad processed in August) took the best part of two days. 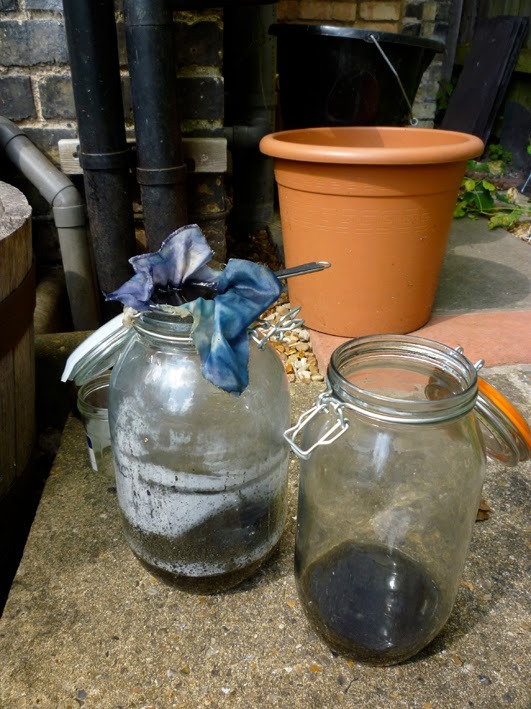 Save the filtrate (the filtered fluid): it probably still contains enough indigo to dye something else blue if you follow the instructions for dyeing with the fresh indigo solution, below. I suspect that’s very impure; there’s probably a lot of vegetable debris as well, but I see no reason for it not to work. I dyed a skein of cotton with the fluid that ran through the silk. A paler blue, but still blue! If you decide to go ahead and dye with the solution, from this point the process is similar to a standard chemical indigo vat. Make a solution of reducing agent (thiourea or Spectralite), 1 tbsp in a jar of warm water and add it to the fluid in the jar. The reducing agent absorbs oxygen in the water, which transforms the insoluble blue indigo particles to the yellowish soluble form. In this form they are absorbed by the materials you want dyed. Now, given that you’re trying to REMOVE all the oxygen from the solution, once you’ve added the reducing agent you should take great care not to ADD oxygen (air!) unnecessarily. Stir gently, don’t create bubbles. To activate it, the solution must now be heated to 100-120°F (38-48°C) for about an hour. Check the temperature of your water bath and adjust it by adding boiling water or cold water as needed. Put the jar in. Stir it gently from time to time and check the colour of the fluid. It should become yellowish: with luck you can see that the bottom of the bubbles and the fluid is in fact yellowish. When it looks like that it’s ready to use. Take the jar off the heat if it’s more convenient. Squeeze excess water from whatever it is you’re dyeing and add it to the jar. Note the bluish tinge to the merino locks, which still contained some air. A hint of what is to come. I left the fibre and yarns (wool and silk) in the jar for about 15 minutes. When removed from the jar oxygen hits the pale green-yellow liquid: it begins to turn blue. First turquoise, then darkening further. You can dye more material in the jar until the indigo is exhausted, but remember that each batch adds oxygen. If the fluid becomes more blue than yellow, add more thiourea or Spectralite and repeat the heating process to drive off the excess oxygen, thus reducing the indigo to the soluble yellowish form that dyes. Different fibres take and hold indigo differently: unlike ‘chemical’ dyes, in which the dye molecules chemically bond to the material, the soluble yellow indigo penetrates into microscopic cracks and crevices where, with luck, the insoluble blue particles are trapped, wedged firm. Those that aren’t trapped firmly will come off on your skin (and everything else) as the indigo blue ‘fades’ over time. Silk and other very smooth fibres have fewer places to trap indigo, so tend to end up paler than wool or cotton. But when they first come out of the vat, everything is simply glorious blue. In this case, glorious blue FROM LEAVES!!! Well, not quite everything. That pinkish-brown skein of silk is just as magical, or even more. Remember I told you to save the leaves strained from the initial solution? 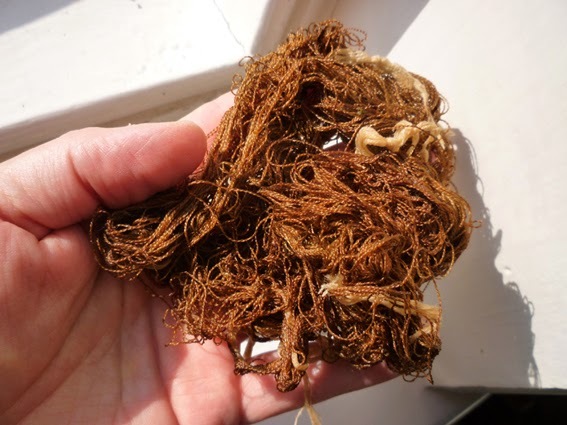 If you now treat the woad leaves from which the indigo was extracted as if they were standard fresh plant material, they will yield a totally different colour: woad pink. Mine was more brown than pink, but still absolutely astonishing to get two such different colours from a single leaf. The technique is simple: stir the strained leaves into a pan of water (I used rainwater, in case our very hard water affected the chemistry) and simmer for an hour or so. 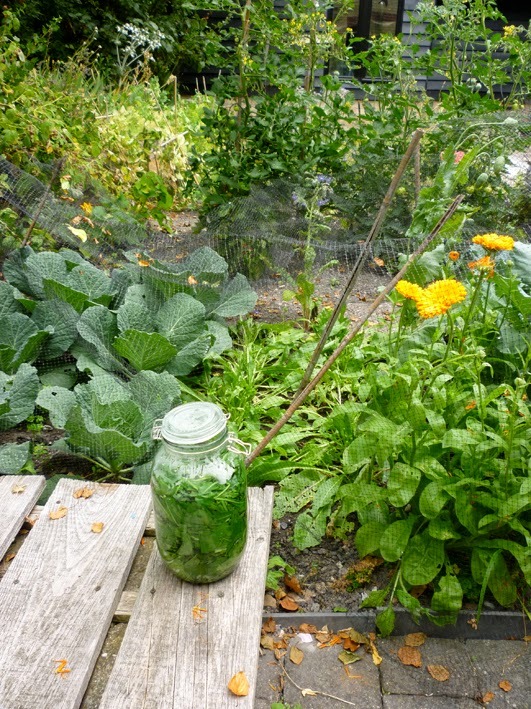 Strain off the leaves – this time you can discard them! – and add 1tsp of alum mordant to the dye solution. 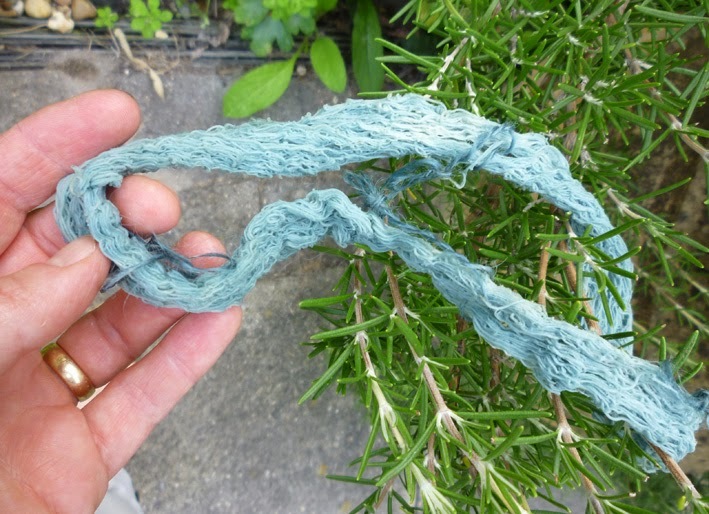 This entry was posted in Indigo, Woad and tagged dyeing, England, Handmade, Homegrown on October 24, 2013 by sarahw.